We start by adding a Tiles component and setting two color selectors for it, this one is as you have noticed is one of my base components combinations. 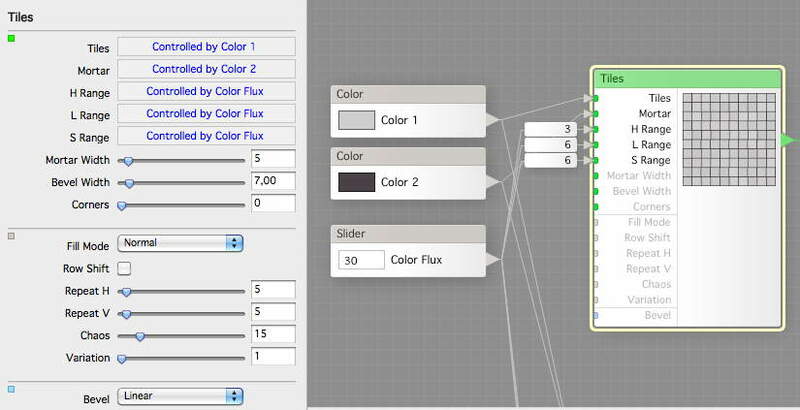 Now we duplicate that tile component, and attach the COlor flux and the colors, but swap places on the colors. 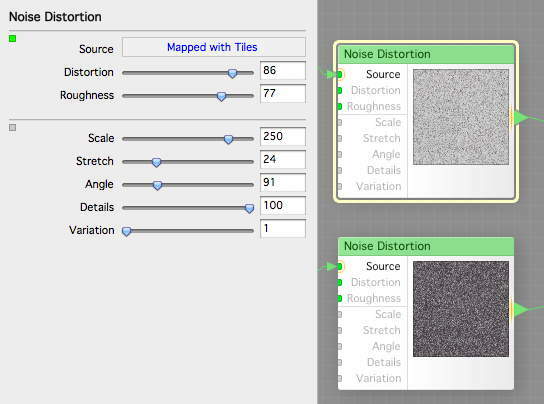 Now we add two identical Noise Distortions and drive the Tiles output to each of them, like this. 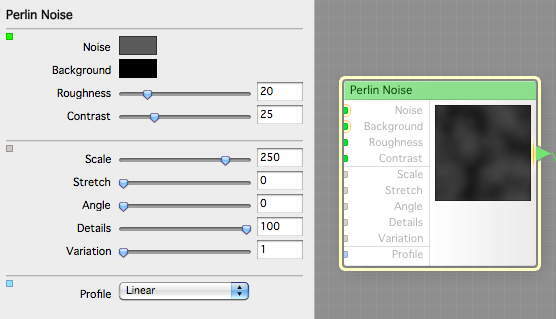 We now create Perlin Noise setup like this. 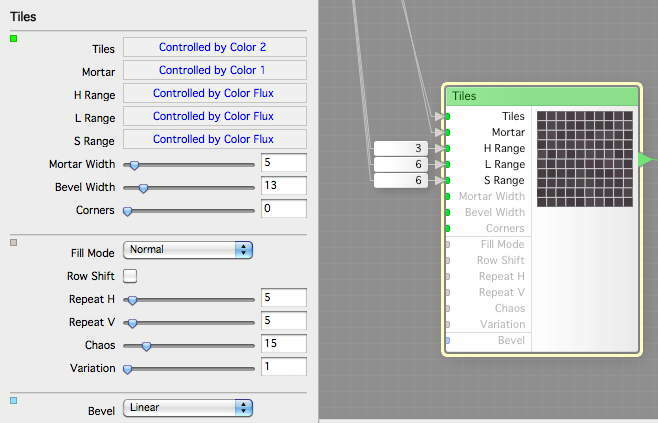 Then we add a Blend node and use the Perlin Noise as before to blend the two noisy colors we had. 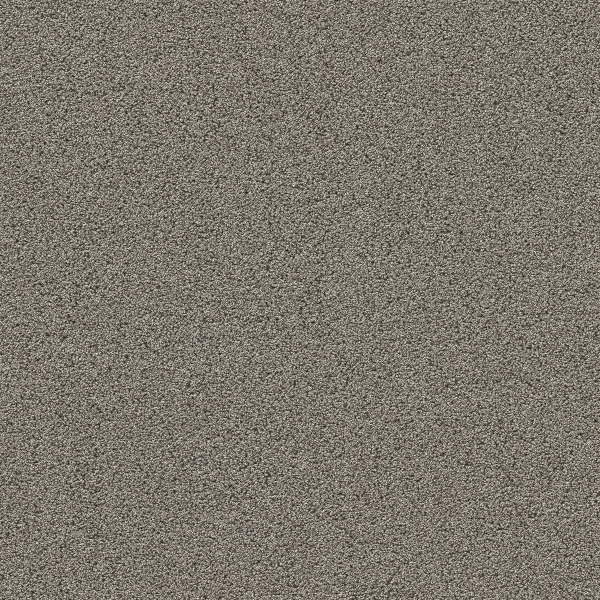 This will be our surface. 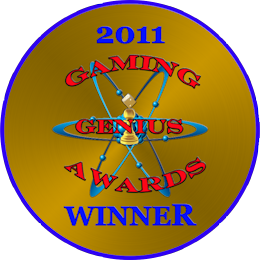 Now we need to fix a height map for this one. We add a Chaffs component setup like this. The we add a Circular Arc wave and set it up like this, and connect that to the Profile of the Chaffs. 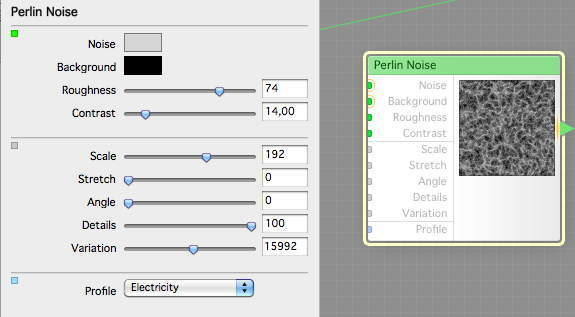 We now create a Perlin Noise setup like this and connect that to the Minimum input if the Circular Arc. This is to create a variable start, making the curve fuzzy. Then we create a Stones and connect that to the Start input of the Circular Arc. This also makes the curve fuzzy. 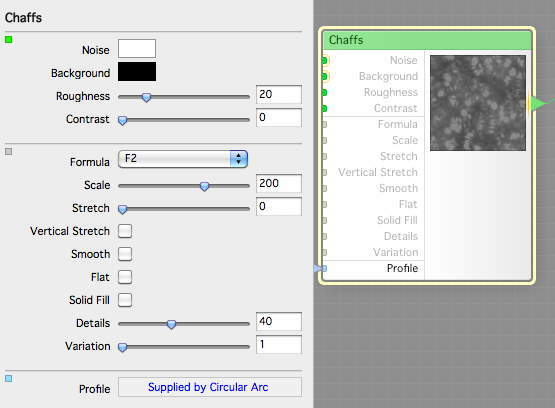 Now, we use a Noise Distortion and connect the Chaffs to this. 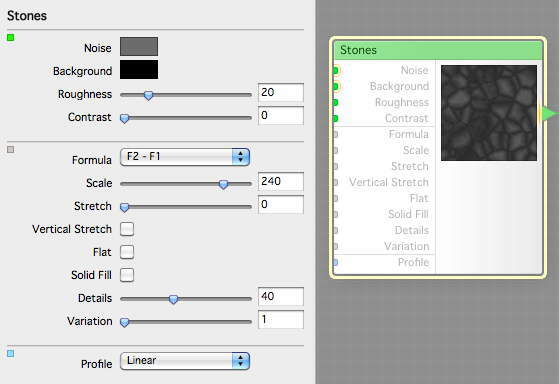 And finally, we use a Tone Curve and a Linear curve setup like this. 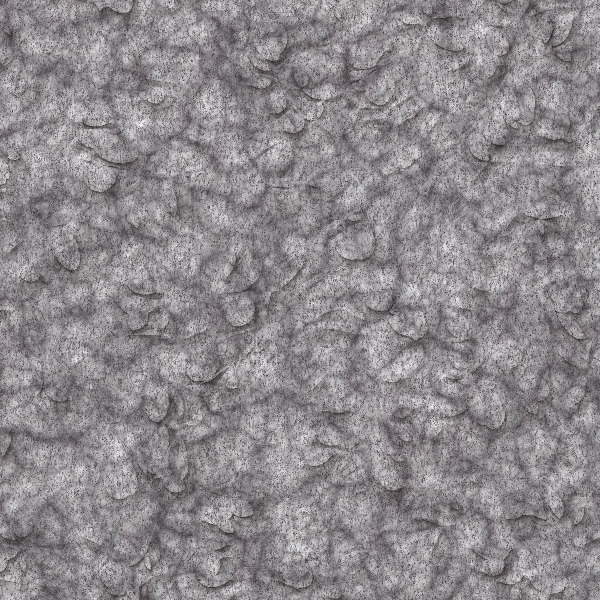 We drive the output from the Noise Distortion through this one, to limit the height map variations. We save this as Stone Tutorial 3 and render. Here it is, rendered using AO to show the features. Looks like a sloppy chopped stone surface, the stone mason has having a hangover today? Now as I said in the beginning, we’re gonna make a quick but good looking mortar. 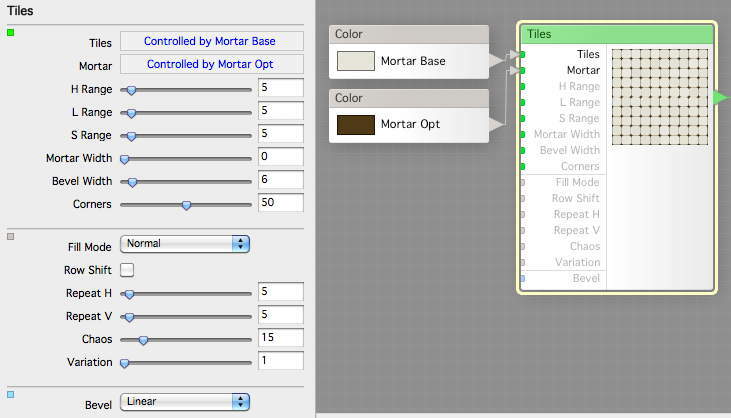 We create Tiles component with Color controls all setup like this. We now, guess what?, run it through a Noise Distortion setup like this. This is our surface, simple as that. 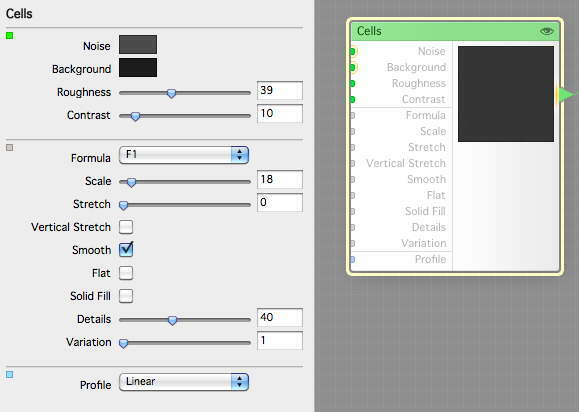 Then we need a height map, so we add a Cells component setup like this, this is all we need. We connect to the Results, save as Mortar tutorial 1 and render. Looking good I think. Here are todays filter snippets to play with.